Our group becomes bigger day by day reaching today’s number of over 12,000 members and with a smaller number of about 50 volunteers or so who co-ordinate and act as the core of the group, responsible for each and every organized activity and gathering. The result of this effort is for the group as a whole to be presented as a compact pressure on public opinion and to decision making centers here and abroad. In this context the Group has made co-operative relations with our compatriots the Turkish Cypriots and with the corresponding initiative group “Famagusta Initiative”, citizens of Famagusta with a common goal. This common goal for the Return to Our Town Famagusta is based on the 1979 High Level Agreement on Cyprus, on UN Resolutions of the Security Council 550 of 1984 , 789 of 1992 and on all consequent Leaders and UN Agreements for the Return of Famagusta as part of the Confidence Building Measures. August 2013 – after vigorous efforts by members Nikos Karoullas and Umit Inatci the St. George Exorinos church within the Walled City of Famagusta was given to us. October 2013 – Peace Chain. October 2013 – Cycling for Peace. December 2013 – we brought together in signing a protocol of cooperation the two Mayors of Famagusta , Alexis Galanos and Oktay Kayalp. 05/02/2014 – RECONSTRUCTION OF FAMAGUSTA , we organized an informative meeting delivered by the group Famagusta Ecocity Project. 10/04/2014 – History was written here. The first Epitaph Liturgy on a Good Friday after 40 years in our Town. More than 5,000 Christian believers attended the Epitaph Liturgy. June 2014 – A Photographic Exhibition by Umit Inatci at the Markets, at the within the Venetian Walls of City of Famagusta with the title “famaGOSTa”. 24/09/2014 – FACE TO FACE at the cultural centre of the Famagusta Municipality in Dherynia, an informative meeting and with the exchanging of views. 31/05/2015 – Sunday Mass at the St. George Exorinos church and a Welcome Ceremony to Mike Elias who has walked 104kms from the Apostolos Andreas Monastrey to Famagusta with the slogan “I walk for a Reunified Country” and Sanctification of Waters at the Glossa Beach next to the barbed wire of our inaccessible and cut off City for 41 years. Β) inform the public of the Role of the Group during the current Political Developments. D) Dialogue and exchange of views with the public..
Ε) Viewing of various films concerning our town. 22/07/2015 – CLEANING OF THE ST. PARASKEVI CHURCH at Kato Varosha. A group of volunteers cleaned the church after 41 years and on Sunday 26/7/2015 Prayer and Litany took place in the churchyard. 24/07/2015 – presentation of the book of the Turkish Cypriot friend and fellow Famagustian Doctor Okan Dagli “TOGETHER IN FOOTBALL”, at the Famagusta Cultural Center of the Famagusta Municipality at Dherynia. 07/10/2015 – the Group of “Debate for the Reforming of Society” known as OPEK and our Initiative Group “FAMAGUSTA OUR TOWN” have organized together a PUBLIC DEBATE on the subject of : « THE ROAD TOWARDS REUNIFICATION – THE ROLES OF LEADERSHIP AND OF THE CIVIL SOCIETY». NICOS CHRISTODOULIDES – Government Spokesman. ALEXIS GALANOS – Mayor of Famagusta, President of the Union of Municipalities, ex President of the House of Representatives. 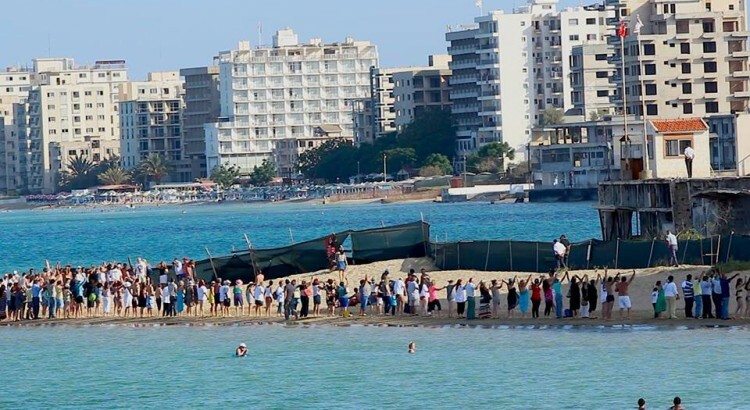 10/10/2015 – ΜΕΜΟΡΥ & PROTEST at Famagusta on the beach, Glossa area. We entered dressed into the sea. We went to the beach not to swim but to be wet in the deep. We went to pay our respects to the Syrian refugees and the innocent souls which were drowned in the seas recently trying to be saved. We went there at our town, at the Glossa area, there where offense is still continuing. We went there to see our Town and tell her that we are many, SHE MUST ENDURE. 15/10/2015 – IN COOPERATION WITH THE Group «FAMAGUSTA RECONSTRUCTION AND REVIVAL» we organised at TEPAK (ΤΕΠΑΚ), Limassol an event with the subject : RETURN – RECONSTRUCTION AND RESETTLING IN FAMAGUSTA. 18/10/2015 – Holy Liturgy at the St. George Exorinos Church in the within the Walls City of Famagusta There where psalms in the church by the choir ROMIOSYNH (ΡΩΜΗΟΣΥΝΗ ) and afterwards a small musical Program with other instrumentalists took place. Ever since 8/12/2013 until today there have been 21 Holy Liturgies (approximately once a month) at the Saint George Exorinos Church. Each Liturgy is attended by many church followers from all over Cyprus. Our group has attented various other events outside Famagusta in the occupied areas of Cyprus such as Kyrenia, Morphou, Limnia, Prastio, Tricomo, Leukoniko, Komi Kepir, Yialousa, Apostolos Andreas ….for us every corner of our Country is OUR TOWN. b. With the T/C Mayor of our Town. c. With the President of DHSY Political Party. e. With the T/C negotiator. f. With Marios Karogian – DHKO Political Party MP. g. With the UK Ambassador. h. Wit the Australian Ambassador. i. With the French Ambassador. j. With the Ambassador of the USA. l. With the Ambassador of China.